At last, a reissue of Pinhas' first and certainly most purely electronic album recorded under his own name. It also marks a time when this was the distinction between Pinhas' solo material and that of the more aggressive guitar oriented work of his alter-ego Heldon, a distinction that in later years became blurred, although that didn't hurt the music of either. Here Pinhas plays all synthesizers (Arp 2600 and Moog 55) and no guitars and, with the exception of the title track, which is enhanced by Francois Auger's drums, this is entirely a solo album in the true sense. Rhythmic pulsating electronic frames with bubbling effects over the top, repetitive yet constantly evolving, very compelling and hypnotic. 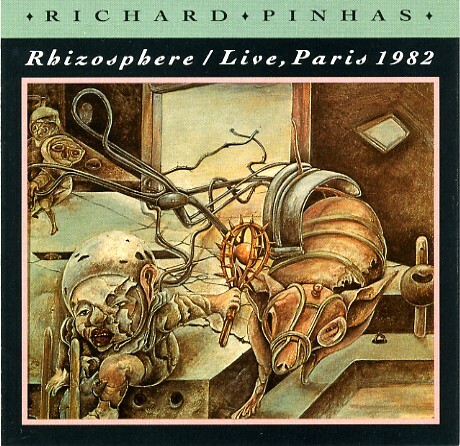 Now on to the second half of the disc – five tracks recorded live at Bobino, Paris in 1982, with an impressive lineup featuring Clement Bailly on drums, Bernard Paganotti on bass and Patrick Gauthier on Minimoog, with Pinhas on guitars, synths and electronics. As one might expect from this lineup, the sound at times approaches a cross between Heldon and Weidorje, especially on "Toward Belfast" and "Last Coda from the Western Wail," where Paganotti's bottom riffing nearly steals the show. There's plenty of Pinhas' trademark guitar here as well. The complete version of this Bobino show has been circulating as a bootleg for many years, so it's good to finally hear some of the best tracks here without the hiss, audience chatter and dropouts; this is a much better recording than I had suspected, and in short is worth the price of the CD by itself.